Our Produce is always the best available. We inspect our produce daily and remove any spoilage so you get nothing but 100% fresh, useable produce. There’s no better value for the money. We carry a full line of produce items but for those hard to find or special produce needs just give us a call, we can normally get it for you by the next day. Give our Produce a try. You’ll be happy you did! 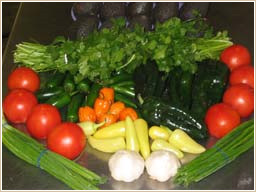 We know Produce and we deliver it fresh! Please continue to scroll down to view the complete list of all our available Fresh Produce Items (some seasonal restrictions may apply). © 2003 - 2019 R&S Mexican Foods, all rights reserved.